Tajin Mild Chamoy Sauce with natural Chile peppers, salt dehydrated lime juice, xantano gum, chamoy flavor and 0.1% of sodium benzoate. 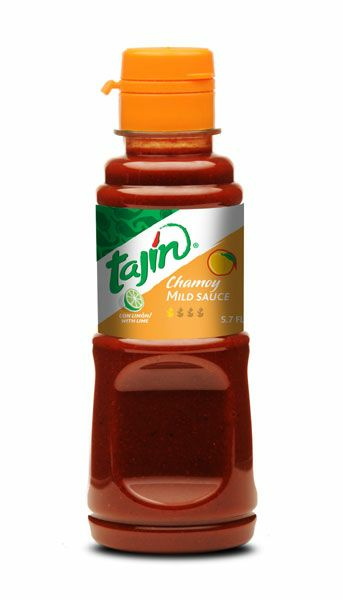 Tajin's chamoy flavored suace is mildy hot, giving your favorite snacks and beverages a unique tangy flavor that is deliciously addictive. It is made with a unique mixture of lemon, chili peppers, salt and slight apricot taste. What makes this sauce even better is that its the only sauce that won't irritate your stomach, while deliciously flavoring your favorite snacks. Pour it over fruits (melons, mangoes, apples, watermelon, oranges, peaches and apricots), desserts (ice cream, slurpies and fruit flavored cake) and flavor beverages or the rim of glasses for popular beverages such as micheladas and margaritas. Ingredients: chili peppers, salt, dehydrated lime juice, xanthan gum, chamoy flavor, 0.1% sodium benzoate (preservative). No artificial colors added.Check out some great Tajin Videos. Tajin Salsa Picante de chamoy con Chiles y Especias. Ingredientes: pimientos, sal, jugo de limon deshidratado, goma xantana, sabor chamoy, 0,1 % benzoato de sodio (conservador). No contiene colores artificiales.